Near-Death Experiences: What Do They Mean? A Featured Guest Speaker was Maggie Callanan, RN, always a popular presenter, hospice nurse, best-selling author of Final Gifts, originator of the term nearing-death awareness. Maggie presented on Final Gifts and on her new book, Final Journeys: A Practical Guide for Bringing Care and Comfort at the End of Life. We regret that there are no recordings of Maggie's presentations. This unique set of seven DVDs includes all the video-recorded presentations from the 2008 IANDS Conference. With 30 years of active duty experience from Vietnam to Desert Storm, Col. Diane Corcoran, RN, PhD, U.S. Army Nurse Corps (ret.) speaks to the needs of the servicemen and women returning with combat NDEs from today's war zones. Bruce Greyson, MD, IANDS Director of Research and a much-published scholar in the field, offers a matchless summary of everything you need to know to talk (or think) intelligently about NDEs. Col.John B. Alexander, PhD, US Army (ret. ), the multi-disciplinary man-about-anomalous-experiences talks about his recent attendance at a Brazilian conference on shamanism, and the relationship between shamanism and NDEs. Near-death experiencers describe their NDEs and the effects on their lives. 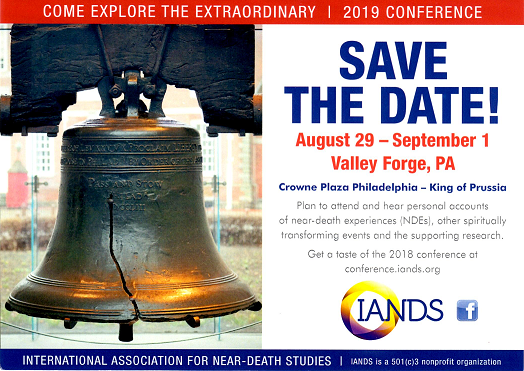 Nancy Evans Bush, MA expands her groundbreaking work on frightening and otherwise distressing NDEs to a multi-disciplinary focus. Tops in their fields as well as engaging personalities and excellent speakers, Drs. Harold Koenig and Bruce Greyson converse about meaning and near-death experiences. A lively and thought-provoking conversation moderated by Nancy Evans Bush. Koenig is Co-director of the Center for the Study of Spirituality, Theology and Health at Duke University Medical Center. Greyson is Carlson Professor of Psychiatry and Neurobehavioral Sciences and Director, Division of Perceptual Studies at the University of Virginia; he was for 26 years editor of the Journal of Near-Death Studies.